It was a fun night. We saw the fireworks at 11, and then we walked to our hotel and went to bed. First race at 11am. 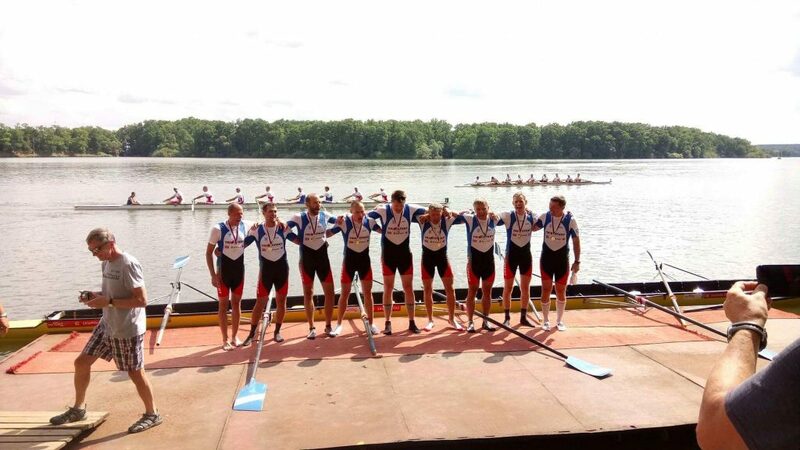 Masters C 2x. 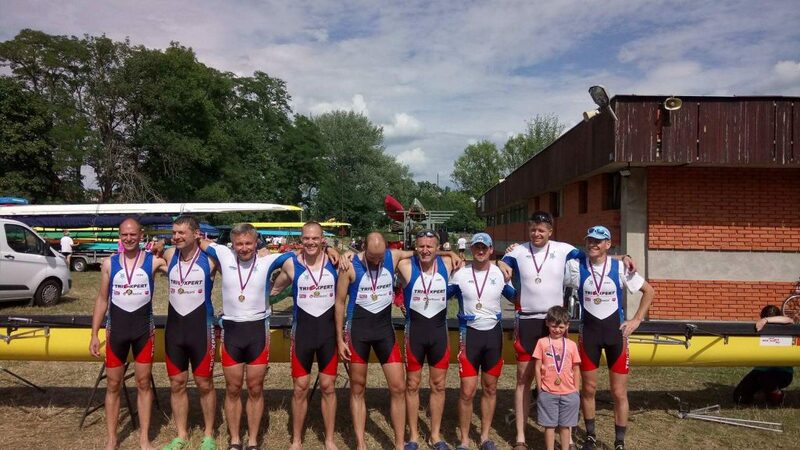 I rowed with Vojta Cernak from Perun Ostrava. 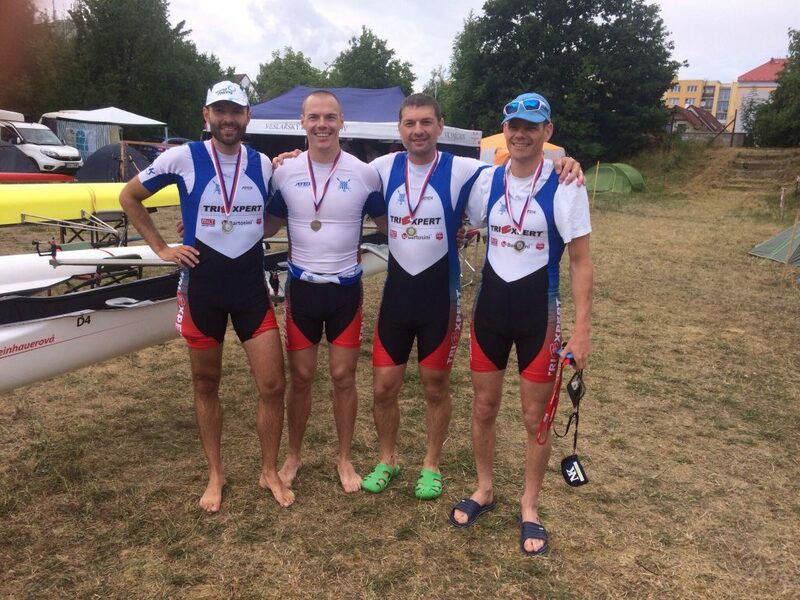 We rowed four trainings together, two in Brno and two in Ostrava (Mordor). The favorites of the races were Petr Mitas and Martin Polasek. And then there were a few other dangerous doubles. Tailwind. We did a few fantastic practice starts, but our race start was not so good and we were in last position. Of course we quickly corrected that, but Polasek/Mitas were ahead of us. We raced in lane 6. Petr and Martin raced in lane 1. That made it difficult to judge their advantage. I stroked and didn’t watch them. After about 200m we were clear of the redt of the pack, and with 600m to go we were a couple of lengths ahead of the pack and one length behind Petr and Martin. At that point I called “go”. We were behind and needed to do something, and we were leading the rest of the field by enough to risk. We didn’t catch them, finishing a few seconds behind them, and with a huge gap behind us and the rest of the field. We had rowed well and finished according the expectations. A third silver medal to my collection of this weekend. The last race for me and also the very final race of the weekend was, at 3:30pm, the Masters Men’s eight. Four boats only. We hadn’t trained together since our win in Prague. 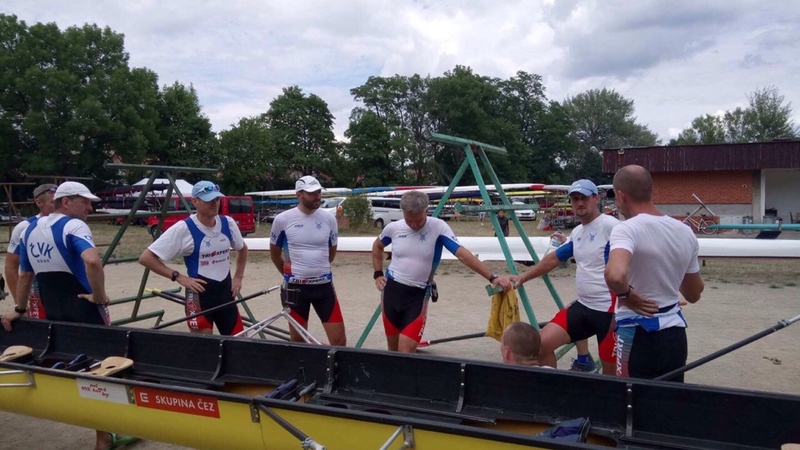 Our opponents were a team of the best rowers from Prague, a combination of the best rowers from Moravia, among others Petr Mitas, Martin Polasek, my double partner Vojta Cernak, and my brother in law Tomas. We are a pure club eight from Brno. 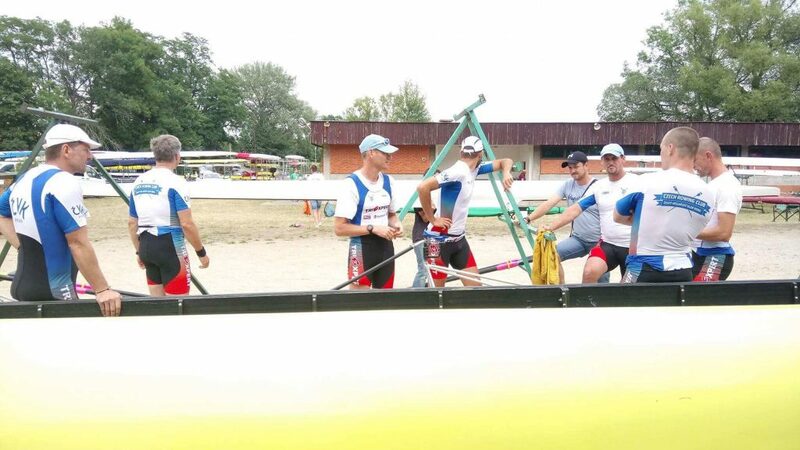 The fourth boat was a pure club team from Prague. The race was a thriller. We were lucky that we racted to the starting signal promptly and got a meter or so on Prague. Then we built that out to half a length. We rowed in lane 1, with Prague right next to us in lane 2. Their cox ess a 15 year old girl and every time she called a power ten, we heard her child’s voice announcing that we were going to be in trouble. To make matters worse, our cox led us into the buoys, so on every stroke our port side, including me, was praying not to hit a buoy, or worse, cstch a crab. The two other boats, including the Moravian selection, were falling behind. We won by half a length in front of a finish area full of Brno fans, so the cheers were great. 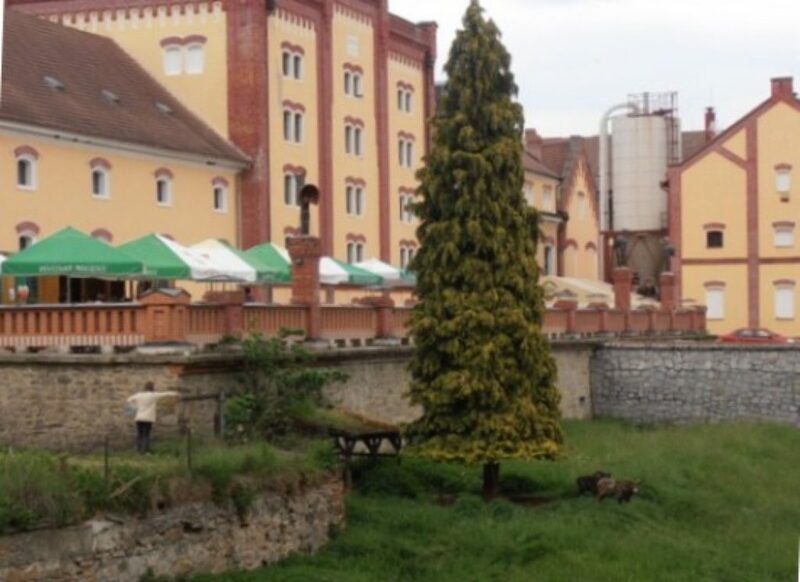 We left Brno around 11am and arrived at 2pm, including a one hour lunch in the nice village of Horni Cerekev. I decided to relax and not row. Romana and I just claimed a few bost stands for our club boats, I prepared my single, and then we went for a short bike tour. I launched at 8am for a quick row. I had left the SpeedCoach holder at the hotel so I rowed ‘unplugged’. 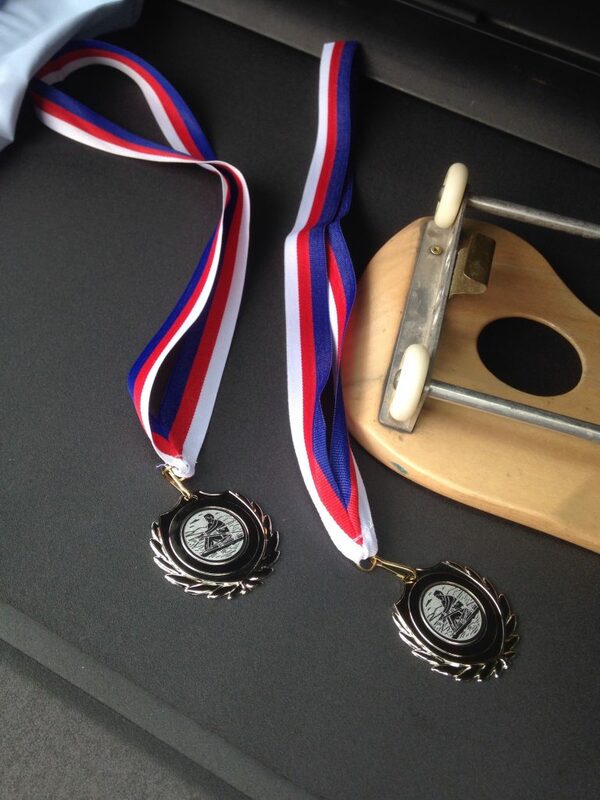 I rowed to the 2k start, then did 2x 30 strokes at race pace, with a 500m paddle between. Then, at the 500m line, I did a 35 stroke interval consisting of 25 race pace strokes and 10 harder ones. The theory behind this is that doing this a few hours before e race will make the transition to lactate burning easier during the race. Usually, the first race of the day hurts a lot agout 300m in, and because I had only two races on Saturday, I thought it would be good to do this. And I think it didn’t hurt. My first race was a tough one. The Masters C single. I was up against Petr Mitas, a guy who always beats me, and a few other guys who shouldn’t be underestimated. Kazi Nedoba from Hodonin, Tomas Zeman from Prague. Six boats in total. I was super concentrated for this race. My plan was to be in front out of the start, then settle for a race pace around 325W, and start attacking whoever would be in front front of me with 500m to go. I think I was second out of the start, but I am not sure. I try not to look. There also was a strong cross/head wind which required a lot of attention in the beginning of the race. By the time I settled down to 34spm, I was in second position, a one third boat length ahead of the ‘pack’ and one boat length behind Petr. Petr battled on at high rate, so I rated back to 35.5 spm. That took me out of the pack but Petr had about 2 lengths on me. With 600m to go the pack was three lengths behind me and Petr was two oengths ahead of me. When I passed the 500m mark I launched my desperate attack. Stroke rate went up to 36spm and I managed to reduce the gap with Petr to a length and a half. At this point in the race I passed to members of my club who were rowing a cooling down from their Masters A 1x. It was great to have them their cheering for me. Unfortunately, my engine stopped producing Watts with about 250m to go. In the cross/head wind I had difficulty keeping the rate and power up. All my muscles were burning and screaming. I tried to hold the power, even ousted two or three screams. But to be honest I basically collapsed. I finished in second place, 8 seconds behind Petr and 9 seconds before the rest of the pack, where a dramatic fight for third place ended unfavorably for my friend Kazi, who came in fourth. 3:56 in head wind. Not bad. It took me along time to start breathing normally, then turn the boat. I collected my silver medal in the medal ceremony under the finish tower and started a long cooling down. Mission failed but I guess it was mission impossible and miracles don’t exist. In the afternoon it was time for the quad. 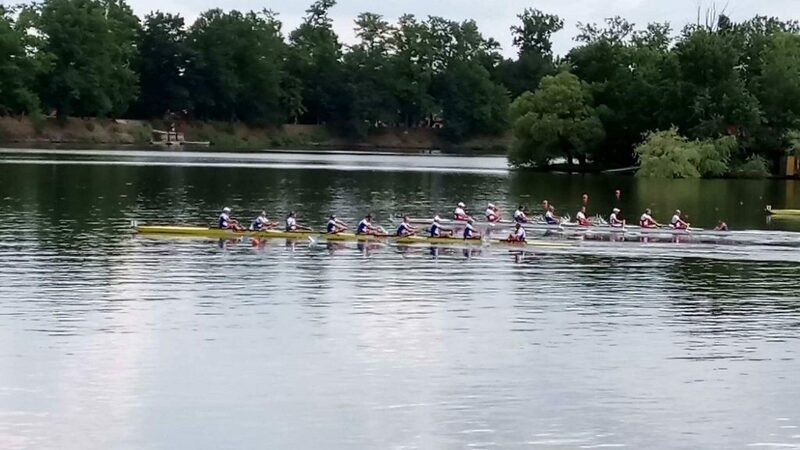 We hadn’t rowed the quad since July 2016, at the same race exactly a year ago. This was a full field, six boats of Masters B quads. We knew Neratovice are good. They beat us two times in a row, and they have raced quad smaller races in Bohemia, winning everything. We didn’t know the other boats. The weather, which had been quite diverse, changing every ten minutes throughout the entire day, showed an ugly face. During the warming up we got a really strong tailwind, throwing big waves. Our practice start was a disaster. The real start was even worse. The strong cross tailwind blew us into the next lane, the starter wouldn’t let us correct that so the only thing we could do was turn the boat at an angle that would bring us back into our lane. Sitting in stroke seat, I had to foot steer strongly to get us straight into our lane. By the time we were done steering and ready for a tactical move, we found ourselves rowing in second position, a lengh behind. The favorites and a little over a length ahead of the rest of the field. We didn’t really try to catch up with Neratovice. Instead, we tried to tap down clean in the very heavy chop and row long strokes. I reduced the stroke rate to a safe 33/34 spm, and we just monitored the remaining four boats behind us. My friend Kazi stroked the Hodonin quad. They managed to manoeuver themselves in third place and subsequently caught a crab with 100m to go, and they ended in fifth place. We were second in 3:17. Not a fast time but with the cross wind and the chop there wasn’t much we could do to go faster.